Welcome to my updated FeaturePoints review! Unlike many other FeaturePoints reviews, I do not endorse FeaturePoints in any way and I give you 100% honest and transparent expert opinion. I guess you may have seen some people reviewing this app and trying to push it to you. 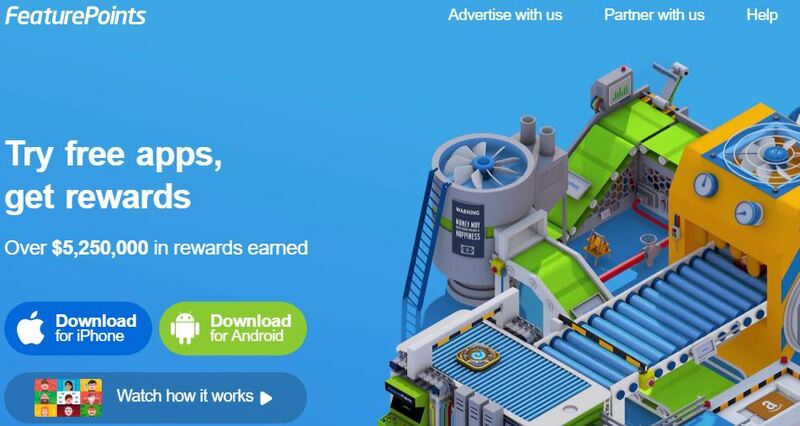 The reason why they do is that either they get paid directly from FeaturePoints through a sponsorship or they want to make money with their referral program. On our website YourOnlineRevenue.com, we only recommend 100% reliable and profitable ways to make money online. If an app doesn't pay well, I am not going to recommend it to you and I will directly tell you an "ugly" truth. So, watch my brutally honest FeaturedPoints video review below and let me know if you have any questions and I'll be happy to help you out! See My #1 Recommendation to Making Money From Home! Overall Rank: 40 out of 100. Short Conclusion: There are much better ways to earn money from home than Feature Points. You can earn some money by accomplishing their tasks. If you don’t have a large audience, you can earn well by referring their app. 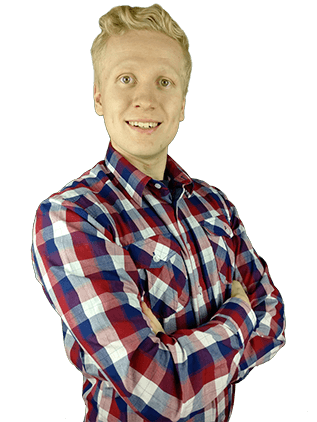 I recommend taking a look at My #1 Recommendation to make money online rather than wasting time with Feature Points. 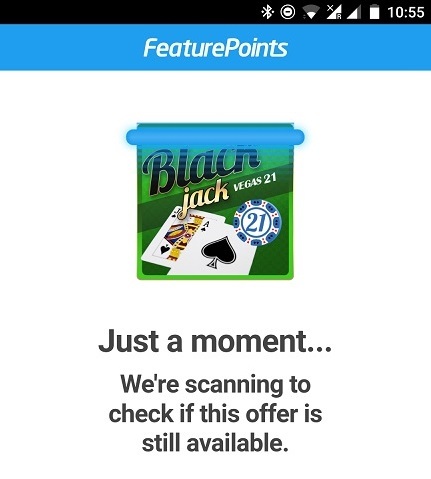 Feature Points is a mobile app that gives you free gift cards and cash. Your task is to download and use apps for a few minutes. Then you will earn points and later you can exchange points into all kinds of rewards. You have probably tried some similar apps like Feature Points. AppNana, Cash App, and many other ones promise you free gift cards and other rewards for accomplishing their tasks. Most of those apps are totally legitimate and they pay you what they have promised. However, sometimes there are errors and bugs which will keep you from earning good money. I will also tell you more in detail bugs that I saw in Feature Points. Another important thing is to evaluate your earning potential with these apps. Yes, you can earn money just by scrolling your phone but if you are making $1-2 per hour, is it really worth it? I will cover all details you need to know about Feature Points on this review. First, let’s take a look how does Feature Points work in practice. How to Make Money with Feature Points? As you can see in the picture below, there are numerous offers available. You can download apps called Just Handbags, Food Lovers, My Gadgets, Unblock It and so on. Some of them give you a little bit more points than others. In the picture, most tasks will give you 225 points but I have seen also tasks that can give you +500 points. You can see the list of available apps on your Feature Points homepage. You never get points just for downloading apps but you need to use them also for a while until you get your rewards. The easiest 50 points that you will get with Feature Points is by using my referral code “roopekiuttu“. You will immediately get 50 points. If you are wondering what does that mean, it’s my name! 😉 Finnish names are a bit different. You can also earn some points by following and liking them on different social medias. It’s useful for them when they get a larger audience and “free advertising”. You will earn 300 points (=$0,5) for creating and publishing a YouTube video. I will post my YouTube video on this review later when it’s ready. However, my experience with Feature Points wasn’t so positive so I am not 100% sure if they are going to give me points if my review doesn’t promote them. We will see. When you have collected enough points you can immediately your rewards. 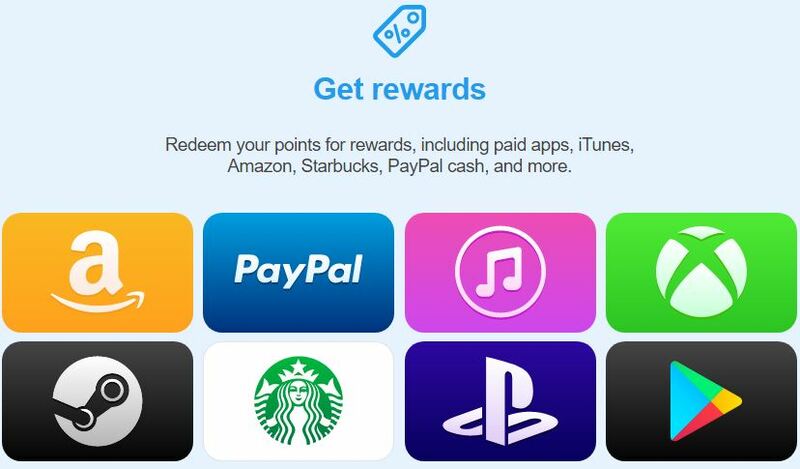 You can get gift cards to Amazon, Google Play, Starbucks or take money out through PayPal. You may be wondering how many points you need to earn in order to convert them into dollars or gift cards. Let’s have a closer look. 600 points are worth $1 so if you want to cash out $10, you need to have 6,000 points. 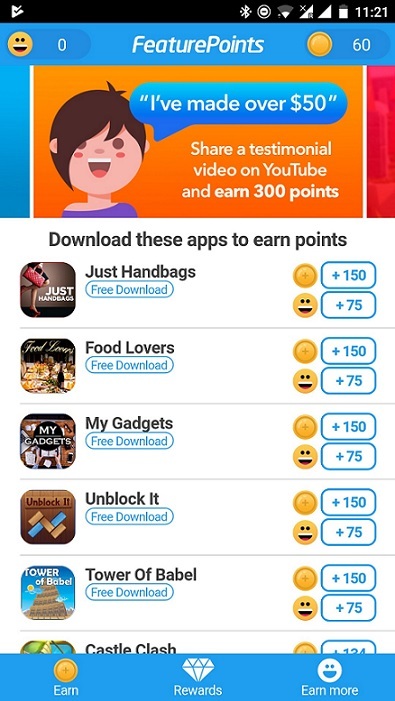 If you earn 300 points for downloading and using the app, it means that you have earned $0,50. If you download all their apps and offers, you’ll most likely reach that $10 target and a little bit more. Then over the time course, there will come more app downloads available so you can earn even hundreds of dollars. However, it requires that you are checking Feature Points regularly. Their minimum cash out limit is at the moment 6,000 points = $10. So you need to use their services for a good while until you have reached it. Some people are doing even a full-time income just by recommending Feature Points app. Have a look at the video below. This guy has earned +$20,000 by using Feature Points (and until today much because this video is already several months old). IMPORTANT NOTE: The fact that this guy in the video has earned tens of thousands of dollars by referring Feature Points is not a sign that you should start using the app. He has a huge following on the social media and millions of people have watched his videos. If you have such a large audience, you can make a full-time income just by promoting almost anything. If this guy in the video would have been promoting something more useful, he would probably make much more money than he is making by selling Feature Points. 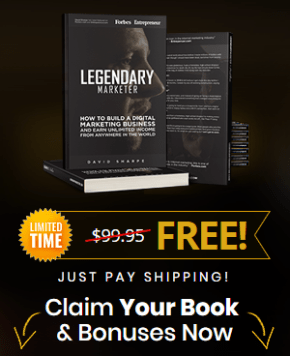 Earning passive income through affiliate marketing (=promoting programs like this) is highly profitable and I do it myself. => Tired of Earning Cents or Pennies? Learn How You Can Make a Living from Home! When you share the app with other people, you will earn commissions. They just need to submit your referral code or sign up through your link. Then you’ll earn 50% of their lifetime earnings. It doesn’t mean that they earn less. It just means that you earn 50% extra meanwhile they get the same money that they would make anyway. It’s a win-win situation. When your friends join through your code, they’ll get 50 extra points. If you have started using Feature Points, I recommend putting my code roopekiuttu so you can get 50 points for free. At the same time, you support my blog by using my code. You win and I win. 50% of earnings can be quite a big thing in the long run. 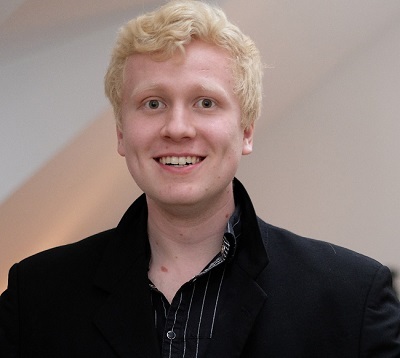 Imagine the guy who has referred this YouTube star. If this man has earned $20,000 using Feature Points, it means that the guy who has promoted him has also earned quite a good money. Sometimes FeaturePoints just keeps on downloading and doesn’t move forward. It’s saying that I need to wait just a moment until they scan if the offer is still available. Their offers are available only for a limited time so sometimes they are gone when you try to earn points. However, often when you see that screen it just keeps on downloading and never ends. Then you need to restart the app and try other offers. It’s a bit inconvenient but that’s how it works. Another thing what happened to me was that I never got points from those apps that I had downloaded and used. The given task was, “Download the app and use it for 2 minutes.” I made sure that I used the app even much more, something like 5-15 minutes. I tried this by downloading several apps and using them. I should have got hundreds of points by doing that. I kept apps on my phone for a weeks after using them and checked if they gave me points. Nothing happened. Those apps were just taking the memory space on my phone but not giving me any rewards. Who knows if there are some tricks that you need to do to get points? I made a little research but didn’t find any info. People just recommended downloading apps, using them for a few minutes to get points. Well, that strategy didn’t work for me. If you have a different experience, I would love to hear it in the comment section below this article. Conclusion – Is FeaturePoints Legit or a Scam? Feature Points is a legitimate way to earn some extra cash. However, as I pointed out above, there are also some bugs that are minimizing your earning potential. Is Feature Points safe? Yes, it is. But you must remember that when you download more apps, they can slow down your smartphone. That’s one reason why I don’t like downloading more apps to my phone. I am also a bit concerned if all apps that they recommend are so good for your phone after all. Summa summarum: You can make some money by downloading apps but not very much. The biggest profits are made through their referral programs. If you are looking for better ways to make money from home, I recommend taking a look at this program. I use it myself and it has allowed me to quit my 9 to 5 job. 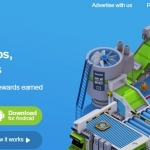 Have you tried FeaturePoints or other similar apps to earn cash? What kind of experiences did you have? Have you already found more profitable ways to earn money like I did? Pays better than most similar apps. Is Zwerl a Scam? No, But Surely Not My #1 Recommendation! Qriket Review: Is Qriket a Scam Or Do They Pay $500 Rewards?